A medical cart can significantly improve the ability of medical professionals to perform their required tasks in an efficient manner. How your medical cart is stocked is an essential consideration as it directly affects the success at the point-of-care. Certain supplies are critical for all health providers as they make their rounds of checking on patients. In addition to including equipment like a barcode scanner or sharps container, the following supplies are a must-have to keep your medical cart well-stocked. Antiseptic supplies prevent the spread of contamination from one area to the other. A medical cart makes it easy to have antiseptic supplies within reach by providing copious storage space in the form of drawers and shelves. Antiseptic wipes, in particular, should be kept stocked in your medical cart at all time. These wipes are used in many situations to sanitize the skin or medical equipment before procedures such as IV insertion. Alcohol prep pads are one antiseptic supply that should be in every medical cart. Single-use supplies prevent cross-contamination and allow for the easy ability to perform sterile procedures. A medical cart organizer enables you to keep a stash of single-use medical supplies on hand for easy access. Single-use supplies may include catheterization kits, specimen collector containers, and blood collection kits. smoother patient experience. If your medical cart has locking drawers, you can keep these supplies protected while still having them nearby. Most clinics and hospitals include a blood pressure check with every patient visit. A selection of blood pressure cuffs in different sizes and grades should be stocked inside one of your drawers. This allows you to accommodate a diverse range of patients. Periodically inspect to make sure that your drawer has a sufficient supply of working blood pressure cuffs. Having blood pressure cuffs in your medical cart allows you to check blood pressure any time you need to without hassle. No medical cart can be called well-stocked without the inclusion of necessary supplies such as swabs, cotton balls or pads, tongue depressors, and applicators. These supplies are frequently used by nurses and medical technicians in their daily rounds. By storing these items in the cart instead of just in the exam rooms, you’ll ensure that you always have what you need right at your fingertips. Hospitals are breeding grounds for infectious disease, for obvious reason. No matter what you’re using your medical cart for, keep the proper protective equipment well-stocked. This includes exam gloves, shoe covers, and head covers. Several boxes of each should always be stored inside your drawers or on your shelves. Medical carts provide convenient storage for these much-needed supplies to prevent cross-contamination. 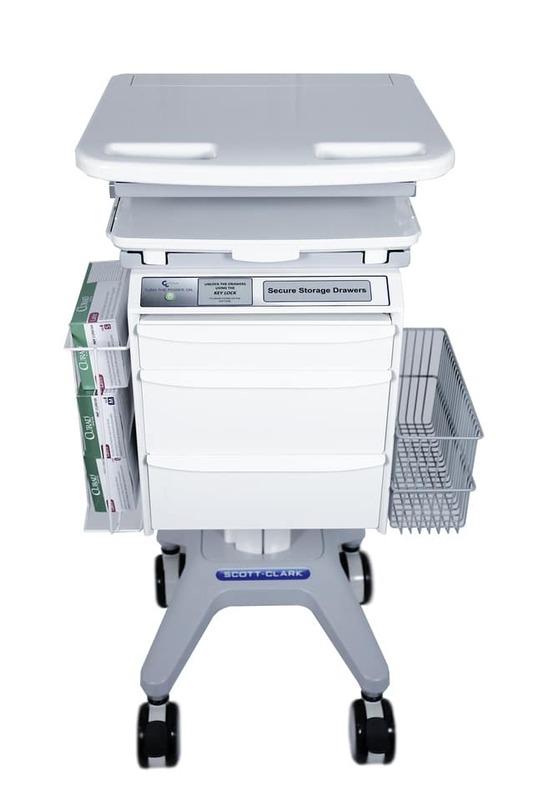 A medical cart on wheels with drawers is the perfect solution to the problem of keeping supplies organized and available at the point-of-care. It makes storing and moving supplies where you need them easy and a seamless part of your workflow. 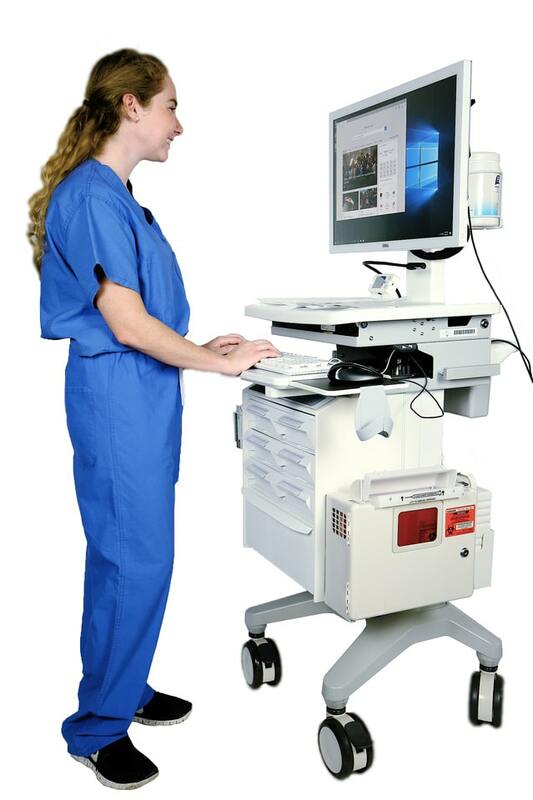 Medical carts act as portable workstations to improve efficiency, care, and safety. Scott-Clark Medical offers a wide variety of customizable medical cart options to suit the requirements of every clinic and hospital.